2 tsp. of dry herbs – basil, rosemary, etc. Stir yeast and sugar into warm water in a small bowl or cup and let stand until foamy (about 10 minutes). In a food processor, add flour, salt, nutritional yeast (if using), and herbs. Pulse briefly to mix dry ingredients together. Once yeast mixture is ready, pour through top of food processor and process for about 45 seconds, until dough starts to pull away from sides of bowl. Add oil, slowly, and process another 60 seconds or so. Dough is ready to go – no additional resting is needed. 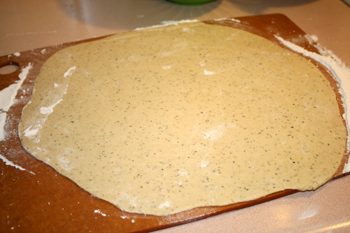 Roll dough to desired shape and size and add your favorite compassionate toppings.